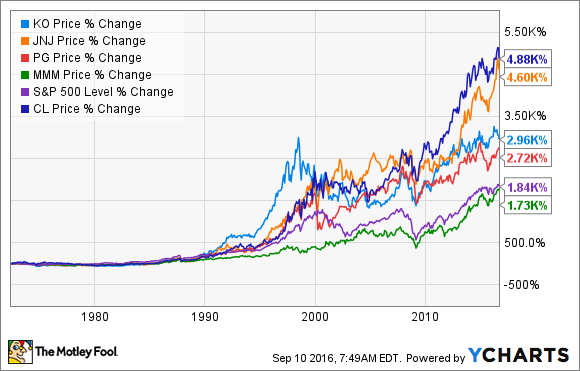 Plenty of investors ask "What is a blue chip stock?" so we answered. Here's a list of a few of the best blue chip stocks you can buy today. What is a blue chip stock? If you had to stop to think, you probably aren't alone. Though the name surfaces frequently in our discussion of investing, no hard-and-fast rule exists. Generally speaking, a blue chip stock refers to a mature, financially secure, and sizable corporation. More often than not, they also often have extended track records of paying dividends. A rough proxy for blue chip stocks would be the companies in the Dow Jones Industrial Average, companies such as Procter & Gamble (NYSE: PG), 3M (NYSE: MMM), Coca-Cola (NYSE: KO), Johnson & Johnson (NYSE: JNJ), and Colgate-Palmolive (NYSE: CL), among many other potential names. Here's a quick snapshot of the numbers that qualify them for blue chip status. Data sources: Google Finance, Dividend.com. Again, it bears noting that these names merely illustrate the kinds of companies that fit the bill, but this isn't the only way to define a blue chip stock. As just one example, Warren Buffett's Berkshire Hathaway wouldn't appear in that list because of its historical practice of not offering a dividend. However, most investors would agree that Berkshire Hathaway qualifies as a blue chip stock. The key takeaway here is that a "blue chip stock" often refers to a high-quality company, subjective though that may seem. Regardless of the exact definition, the evidence suggests that investing in blue chip stocks tends to bode well for investors willing to hold them over the long term. Here's how the five blue chip stocks mentioned -- Procter & Gamble, 3M, Coca-Cola, Colgate-Palmolive, and Johnson & Johnson -- have performed versus the S&P 500, going as far back as our charting tool will allow. Admittedly, the above sample size of five names serves as anecdotal evidence. At the same time, though, investing in blue chips touches on several schools of investing that tend to outperform the market over the long term. One of the defining characteristics of blue chip stocks is their quality, expressed here in one way by their dividend growth prowess. We know dividend growth investing tends to handily outperform the market averages over time, especially when dividends are reinvested to buy more shares. Seen this way, buying blue chip stocks can be seen as an indirect way to follow a strategy we know works quite well. The idea underpinning this strategy's outperformance is simple but not obvious. According to the World Economic Forum, the average lifespan of a Fortune 500 companies is between 40 and 50 years. What's more, the average lifespan of a company appears to be falling. So blue chip companies that are able to remain in operation, such as those in our example, are by definition above average. What's more, having been able to both pay dividends over so long a period and consistently increase them speaks to the remarkable quality of these companies. Of course, no company remains impervious to change, so you can't think that simply buying select blue chip companies is a one-way ticket to easy street. Sears, Roebuck probably seemed like a no-brainer investment at one point. As with any investment strategy, diversification is crucial to owning blue chip stocks. However, the strategy appears to lie on sound investing principles. As Warren Buffett has famously said, "It's far better to buy a wonderful company at a fair price than a fair company at a wonderful price," and that's precisely what investing in a diversified basket of blue chip stocks may allow investors everywhere to do.